The makings of your mini-me’s very own haven begin with this ultra-dapper chest of drawers. Gray hue finishes off the replicated oak wood grain with an authentic touch. Chrome-tone bin pulls and bracket feet elevate the contemporary appeal. 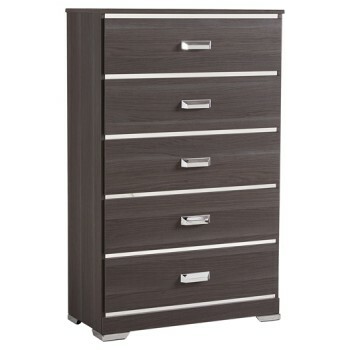 Roomy drawers are spaced with chrome-tone rails and lined inside with a faux linen laminate for a clean finished look. You’re going to love the ease of keeping belongings stored here.